Though the calendar in Anthony Goldsby’s Kansas City, Mo., office reads March 1, the weather outside — subzero temperatures with snow on the way — sure didn’t make it feel like March. Tony Goldsby, Ph.D., is a research agronomist for The Andersons. 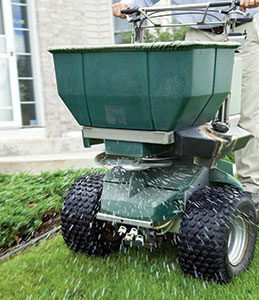 Last year’s truncated spring season in many parts of the country made work challenging not just for LCOs but also for companies like The Andersons that sell to lawn care companies. Thankfully, combination products were designed for instances like this, helping LCOs who find themselves short on labor and now even shorter on time. Jeremy Bigler, professional landscape channel manager for Lebanon Turf, echoes those comments. A relatively new development in combination products that has both Bigler and Goldsby excited is the inclusion of Mesotrione in fertilizers to prevent weeds in newly seeded grass. With Tupersan (active ingredient siduron) losing its Environmental Protection Agency registration, Mesotrione — and the robust list of weeds it controls — has come around just in time. Goldsby again points to the calendar when speaking of the benefits of Mesotrione. Goldsby, who was a researcher at Kansas State University early in his career, says it has been an exciting time in the industry for him and his colleagues, keeping up with advancements in fertilizers as they come out of development and become available to customers.